As the summer deepens, prickly pears are ripening in the desert. In the higher elevations, they may still be a few weeks away from that perfect juicy purple ripeness. I’ve been playing with prickly pears for more than 40 years, and have finally settled on the easiest, quickest way to make the juice. I’m a little embarrassed when I think of all the time I’ve wasted in earlier years with more complicated techniques. The first thing to do is assemble your tools. Do this first and you’ll save time and aggravation in the long run. 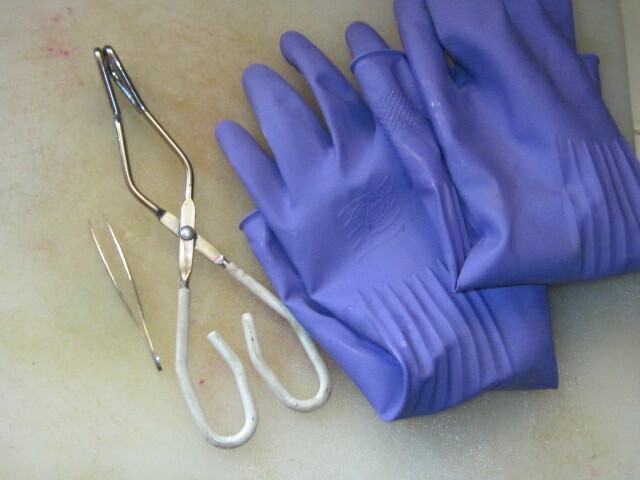 You need tongs, tweezers and rubber gloves. Just grocery store gloves will do, but buy good ones, not the cheapest. This will keep most of the stickers out of your fingers. The tweezers are for the occasional sticker that will still find its way into your hands. First rinse the fruit in a colander to wash off any dust. 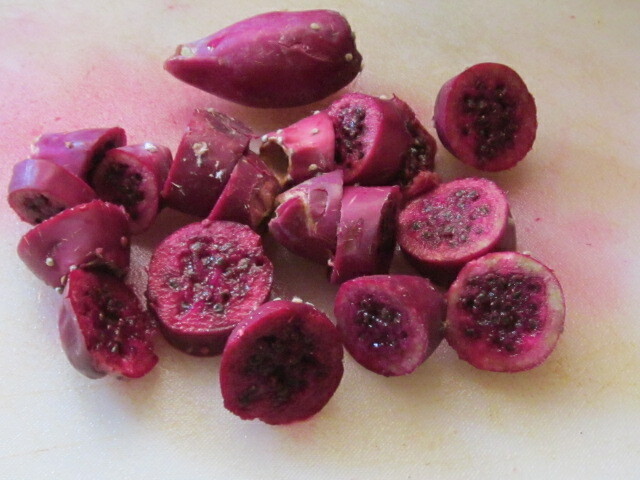 Then cut the prickly pears into big chunks — three to four pieces each. Cut the fruit into big chunks. You do not need to take off the stickers or peel them. The peel is contains healthy nutrients. It is especially rich in betalains, which are powerful antioxidants. 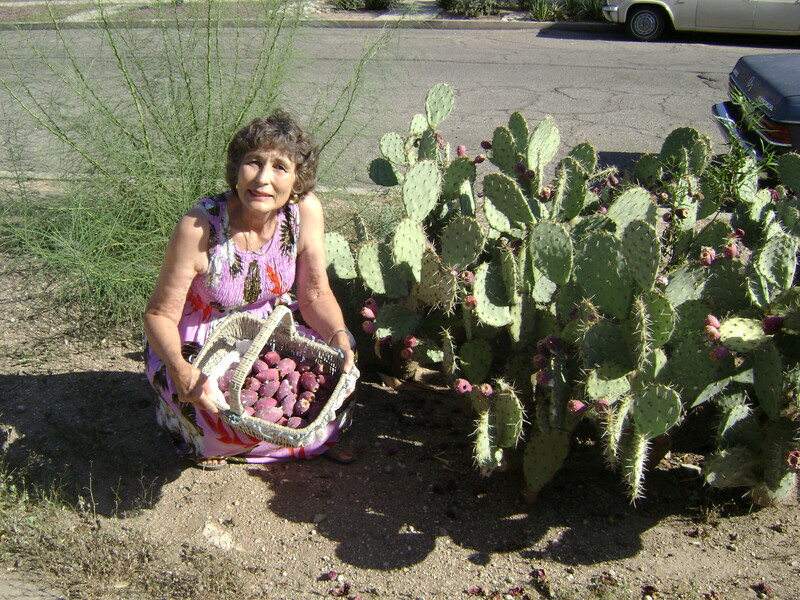 In fact, prickly pears are the only know source of all of the 24 naturally occurring belatains. If you’d like to learn more you, can read about it here. Prickly pears are also high in vitamins A and C.
Cut up about a dozen pears, a few more if they are small, and put them in a blender jar. For the first batch, you’ll need to add about a fourth cup of water to get the process going. (For later batches, just use a little juice from the first batch). Run the blender until you have a nice slurry. 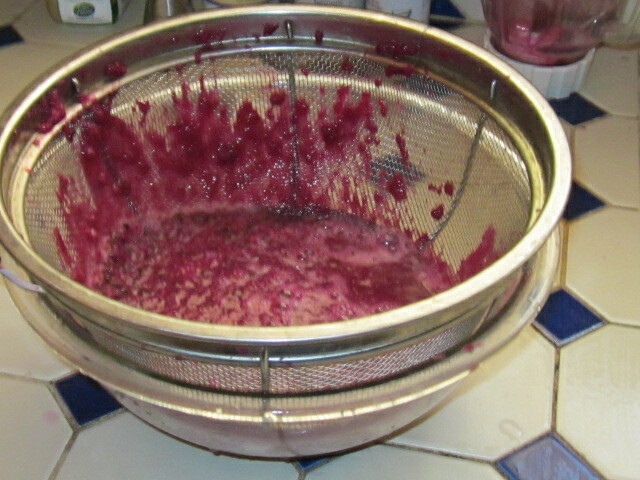 Then strain through a fine sieve. Sieve will strain out seeds, stickers, everything but delicious juice. 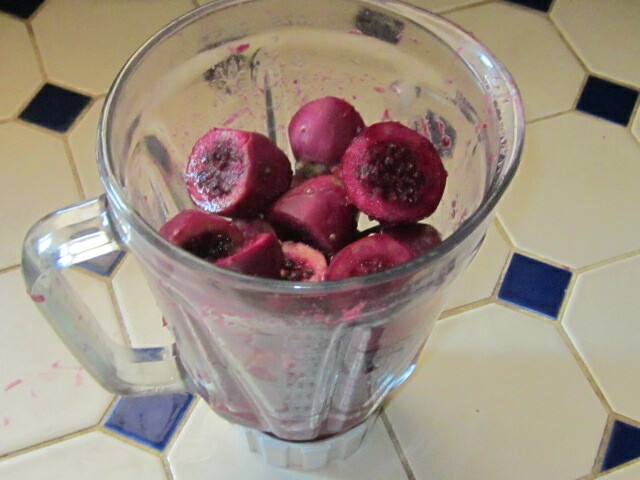 Around a dozen prickly pears should give about a cup of juice. To make syrup, transfer it to a saucepan, add 1 1/2 cups of sugar (or less), a little lemon juice and about a teaspoon of cornstarch. Cook until thickened, store in jar and refrigerate. 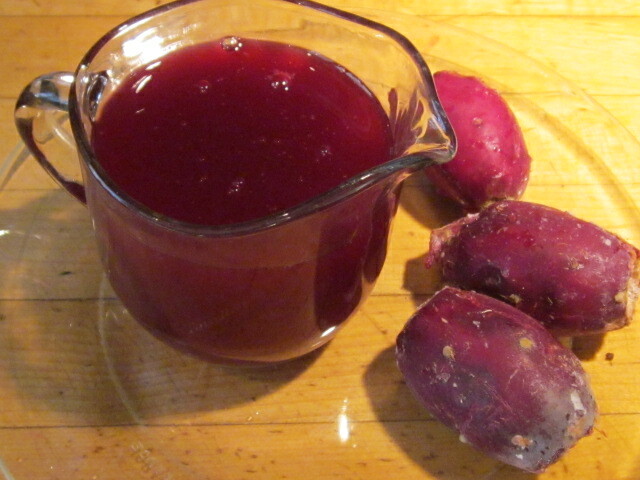 Use your prickly pear juice in drinks or use it to make syrup. You can use your syrup to top pancakes, waffles, French toast or ice cream. If you are interested in branching out to other recipes you can learn about Prickly Pear Onion Jam, Prickly Pear Barbecue Meatballs or Prickly Pear Ice Cream in The Prickly Pear Cookbook. One my favorite recipes is Prickly Pear, Citrus and Chipotle Sauce for Chicken in The New Southwest Cookbook. Two simple but delicious recipes are Prickly Pear Salad Dressing and Summer Jam in my latest book Cooking the Wild Southwest. I just stumbled on this post and feel compelled to add to it. We just finished processing about 4 gallons of puree. The first step was to spread the fruit on concrete and quickly blast with a garden torch to burn off spines and blanch the skin. I am telling you this process because I found a much simpler method!!! Yesterday I got out the 35 year old Moulinex juicer and tried it out. This is a cheap juicer, if I burn it up, I will get another, but this is the best method so far. i may try pumping the puree through a 10 to 20 micron cartridge particulate filter. My goal is a clean syrup suitable for a wine, or mesquite honey mead combination. I think I need to boil it to sterilize any naturally occurring microbes. Thanks for adding your experience, Mark. At the Prickly Pear Festival over the weekend people were asking about juicers. I think that the ultimate use of the juice determines how finely it needs to be strained. For your wine, you don’t want any sediment. For something like ice cream or jam, some pulp is fine. As for boiling, if you are going to use it fresh or cook in some other preparation, pre boiling isn’t necessary. But for long term storage, I agree it is an good idea. The same reason that we blanch vegetables before freezing — get rid of microbes and stop other natural processes. Can you freeze the syrup? If yes, then how long? Actually, with enough sugar in the syrup, you can just hold it in the refrigerator for several months. Sugar is a great preservative. If you are just making the juice, you should freeze that as it will just hold in the refrigerator for a week or less. I’ve keep juice in the freezer for up to a year. Thank you. I ended up processing the fruit late last night. I decided to freeze it in ice cubes. I read on a couple of other sites that prickly pear cactus fruit should be preserved with 1/2 lemon juice for ever 3 cups of puree to prevent oxidation. I did this, but I’m not sure that I love the end result.